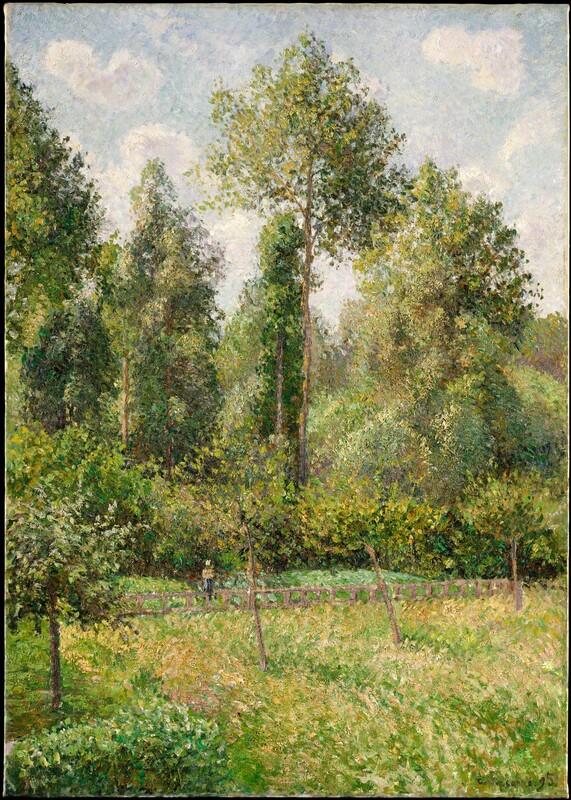 This canvas of summer 1895 shows a corner of Pissarro's garden at Éragny, a small village in northern France where he lived from 1884 until his death. Pissarro likely painted this view from his studio window, as a persistent eye ailment hampered him from working outdoors. The picture was among the works that Pissarro sold in November to the dealer Durand-Ruel, who included it in a major exhibition of the artist’s work the following spring. Inscription: Signed and dated (lower right): C. Pissarro.95. Paris. Galeries Durand-Ruel. "Exposition d'œuvres récentes de Camille Pissarro," April 15–May 9, 1896, no. 29 (as "Peupliers"). Paris. Galeries Durand-Ruel. "Exposition de tableaux de Monet, Pissarro, Renoir & Sisley," April 1899, no. 60 (as "Peupliers, Éragny"). Paris. Galeries Durand-Ruel. "Tableaux et gouaches par Camille Pissarro," January 10–26, 1910, no. 13 (as "Peupliers"). Palm Beach, Fla. Society of the Four Arts. "Loan Exhibition of Paintings and Drawings by Camille Pissarro, 1830–1903," January 9–31, 1960, no. 18 (lent by Miss Adelaide Milton de Groot, New York). Canberra. National Gallery of Australia. "Paris in the Late 19th Century," November 30, 1996–February 23, 1997, unnumbered cat. Brisbane. Queensland Art Gallery. "Paris in the Late 19th Century," March 15–May 22, 1997, unnumbered cat. Martigny. Fondation Pierre Gianadda. "The Metropolitan Museum of Art, New York: Chefs-d'œuvre de la peinture européenne," June 23–November 12, 2006, no. 42. Barcelona. Museu Nacional d'Art de Catalunya. "Grandes maestros de la pintura europea de The Metropolitan Museum of Art, Nueva York: De El Greco a Cézanne," December 1, 2006–March 4, 2007, no. 34. Berlin. Neue Nationalgalerie. "Französische Meisterwerke des 19. Jahrhunderts aus dem Metropolitan Museum of Art," June 1–October 7, 2007, unnumbered cat. Camille Pissarro. Letter to Durand-Ruel. November 22, 1895 [published in Janine Bailly-Herzberg, ed., "Correspondance de Camille Pissarro: Tome 4/ 1895–1898," Paris, 1989, p. 122, no. 1176], lists it among works sold to Durand-Ruel. Gustave Geffroy. "L'Art d'aujourd'hui: Camille Pissarro." Le Journal (April 18, 1896), p. 5 [see Ref. Snollaerts 2005]. Georges Lecomte. "Notes d'art: M. Camille Pissarro." La Justice (April 22, 1896), p. 1 [see Ref. Snollaerts 2005]. Ludovic Rodo Pissarro and Lionello Venturi. Camille Pissarro, son art—son œuvre. reprint ed. 1989. Paris, 1939, vol. 1, p. 208, no. 920; vol. 2, pl. 186, no. 920, as in the de Groot collection, Paris. Anne Schirrmeister. Camille Pissarro. New York, 1982, p. 14, colorpl. 8, notes that this view of his garden was probably painted from Pissarro's studio window. Charles S. Moffett. Impressionist and Post-Impressionist Paintings in The Metropolitan Museum of Art. New York, 1985, pp. 94–95, ill. (color, overall and detail), comments that the figure in the background is a reminder of Pissarro's interest in peasant life; remarks that it is among the paintings that Pissarro sold to Durand-Ruel on November 22, 1895. Katharine Baetjer. European Paintings in The Metropolitan Museum of Art by Artists Born Before 1865: A Summary Catalogue. New York, 1995, p. 440, ill.
Jane Kinsman in Paris in the Late 19th Century. Exh. cat., National Gallery of Australia. Canberra, 1996, pp. 42–43, 183, ill. (color). Claire Durand-Ruel Snollaerts in Joachim Pissarro and Claire Durand-Ruel Snollaerts. Pissarro: Critical Catalogue of Paintings. Milan, 2005, vol. 1, pp. 364–65, 368, 393, 419; vol. 3, pp. 687, 955, 958, no. 1082, ill. (color). Kathryn Calley Galitz in The Metropolitan Museum of Art, New York: Chefs-d'œuvre de la peinture européenne. Exh. cat., Fondation Pierre Gianadda. Martigny, 2006, pp. 222–24, no. 42, ill. (color) [Catalan ed., Barcelona, 2006, pp. 122–23, no. 34, ill. (color)].